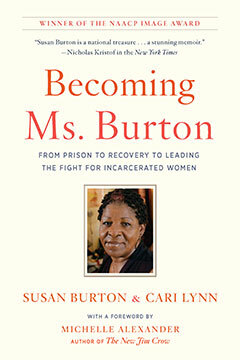 Widely hailed as a stunning memoir, Becoming Ms. Burton is the remarkable life story of the renowned activist Susan Burton. In this “stirring and moving tour-de-force” (John Legend), Susan Burton movingly recounts her own journey through the criminal justice system and her transformation into a life of advocacy. After a childhood of immense pain, poverty, and abuse in Los Angeles, the tragic loss of her son led her into addiction, which in turn led to arrests and incarceration. During the War on Drugs, Burton was arrested and would cycle in and out of prison for more than fifteen years. When, by chance, she finally received treatment, her political awakening began and she became a powerful advocate for “a more humane justice system guided by compassion and dignity” (Booklist, starred review). Her award-winning organization, A New Way of Life, has transformed the lives of more than one thousand formerly incarcerated women and is an international model for a less punitive and more effective approach to rehabilitation and reentry. Winner of an NAACP Image Award and named a “Best Book of 2017” by the Chicago Public Library, here is an unforgettable book about “the breathtaking resilience of the human spirit” (Michelle Alexander). “Valuable… [like Michelle] Alexander’s The New Jim Crow, Nell Bernstein’s Burning Down the House, and Bryan Stevenson’s Just Mercy. Susan Burton Featured as Starbucks "Upstander"